The USD fought back from its lows, stocks pulled back from their highs into the close in what was an indecisive day before the weekend’s big G20 meeting where increasingly my sense is traders are hoping for an outbreak of tradewar glasnost. Can it happen? Sure it can? Will it happen? That’s complicated – see below. One highlight Thurday was the release of FOMC minutes which suggest Jerome Powell did not blink after Trump criticism but rather the Fed is gebuinely data dependant. That’shardly positive for stocks if they pause when you consider why that might be. A little later than usual today – with the big events on teh weekend I wanted to take my time to map out my thoughts. 5 hours later, here you go. US stocks were off their lows but also off their highs.The lows were achieved after worries that trade hawk Peter Navarro’s inclusion in theTrump/Xi dinner list was a negative on positive expectations. But stocks recovered and though the Fed minutes gave a clear explanation of the banks thinking and that more increases in rates are likely it wasn’t till the very end of theday that the sellers swooped once again. That may set the tone for week’s end before we all wait for Monday morning’s gap – one way or the other – in Asia. So, at the close the S&P 500 is off 0.2% to 2,737, the Dow is off just 0.11% at 25,358 and the Nasdaq and Russell 200 lost 0.3% respectively to 6,892 and 1,525. In Europe stocks were mixed. The FTSE as 0.5% higher, teh DAX flat, teh CAC up 0.46% andthe FTSEMIB rose 0.23%. German inflation data didn’t seem to hurt and the Italaians seem to be negotiating with the EU on the deficit. On forex markets, the USD is roughly flat, Euro is up 0.2% at 1.1392, the Pound is lagging on Brexit negativity and lost 0.3% to 1.2780ish, while theYen gained 0.2% to 113.43 in USDJPY terms. The commodity bloc saw the Aussie outperform and its at 0.7318 for a 0.2% gain while the NZD is down a similar amount at 0.6856. The CAD is flat with USDCAD at 1.3283. To commodities then and wild moves were seen Thursday in oil markets. This time though some soothing comments sourced to Russia pulled the market back from the brink of another selling frenzy. At the end of play WTI was up 2.23% to $51.42 while Brent lifted 1.1% to $59.39. Copper lost about 0.6%, gold is at $1223 largely unchanged, likewise with silver at $14.28. Bitcoin is at $4200. US 10’s and 2’s reversed a rally in Europe to close at 3.30% and 2.82% respectively. On the day today we get private sector credit in Australia but the big release is the official Chinese PMI’s. Housing starts and construction are out in Japan and then its German import prices and retail sales before French inflation data and EU employment and CPI. GDP is out in Canada and then look to a speech by NYC Fed boss John Williams to iron out any misinterpretations that the Fed sees in the market reading of recent events – if there have been any. I’m still torn on how I’m betting this Trump/Xi meeting at the G20 meeting will go. Thursday in US trade news that trade hawk Peter Navarro had been added to the invite list weighed on stocks a little. That’s because a few weeks back it seemed he was on the outer and more concilliatory voices like Larry Kudlow and Steve Mnuchin back in the ascendancy. Of course we know discussions have recommenced and the Wall Street Journal reported that the US and China are working on a “framework” that allows a de-escalation after the Presidents meet. So the chance of something positive coming from this weekend’s meeting are high. But then BBC journalist Karisma Vaswani is also right when she highlights the big picture and broader forces which make it hard for President’s Trump and Xi to actual do a deal. China wants to control everything, the US wants open markets and free access – not to mention the hegemonic battle that is also underway. And as I shared on Twitter yesterday, “US Navy warships just rocked the Taiwan Strait in a power play ahead of Trump’s meeting with the Chinese president” Geopolitcs and trade are not easily seperated. Especially when China is clearly trying to place itself at the centre of the world (BRI) and become the dominant economy and power. To use a very tired – but still apt – phrase, “it’s complicated. And the point here about complications is that GM’s decision to sack workers and shut plants has complicated this weekends meeting. As noted earlier this week he railed against GM, that no plants were shut in China or Mexico, and now Navarro is back on the invite list. It’s complicated. And it’s complicated to understand what he’s going to do. But it does appear he is studying a ramp in car tariffs. An of course he was coy about whether a deal can be done this weekend telling reporters as he left for Argentina, “I think we’re very close to doing something with China but I don’t know that I want to do it. Because what we have right now is billions and billions of dollars coming into the United States in the form of tariffs or taxes”. It’s complicated. Powell didn’t cave into President Trump, the release of the Minutes to the last FOMC meeting Thursday in the US highlight his message was consistent with Fed thinking. Note the plural here, “Almost all participants reaffirmed the view that further gradual increases in the target range for the federal funds rate would likely be consistent with sustaining the Committee’s objectives of maximum employment and price stability”. Increases. Plural again, “However, a few participants, while viewing further gradual increases in the target range of the federal funds rate as likely to be appropriate, expressed uncertainty about the timing of such increases”. Data dependance, “Participants emphasized that the Committee’s approach to setting the stance of policy should be importantly guided by incoming data and their implications for the economic outlook.” So no “preset course”. Even though the committee used the plural for increases in rates it thinksit’s time to do away with the communication of that in the statement.That gives them optionality and shows they are truly data dependant. On balance the Fed is getting closer to a pause. But it’s not there yet. As I’ve written recently that’s how the RBA has managed to get close to 3 decades without a recession. Move, pause, evaluate, move, pause, evaluate, rinse repeat. 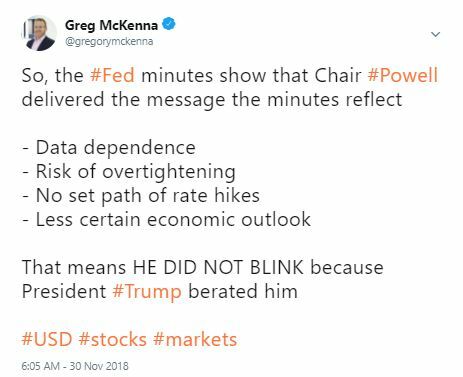 So, on balance, even though the minutes show Fed chair Powell refelcted the FOMC’s view not what the president wanted him to say and that that means more rate hikes will flow if the data allows it, there was nothing in the minutes to spook the stock market of buoy the USD at this time. Looking at the S&P 500 then on the charts, Three very good days of rallies have have been followed by a small fall on the S&P hysical and an idecisive day on the futures. It’s one heck of a recovery from the October lows and could run back to the the top of what looks to be an emerging range – that level is around 2,823. But it’s stalled around the 2,733/2,744 resistance zone (different time frames and moves) I mentioned yesterday. This looks like important resistance and given the selling on close in the US and the proxiimity of the Saturday meeting between Xi and Trump maybe we might see more caution than bullishness Friday in US trade. Monday morning in Asia when US furutes open is going to be huge. I’m going to put this out there. The headline chasing algos drove the USD and stocks in reaction to the Powell speech yesterday but bonds didn’t react, haven’t reacted to all the noise lately. Why? Less headline – if any in a amterial sense – headline chasing algos in bonds. What’s it mean? 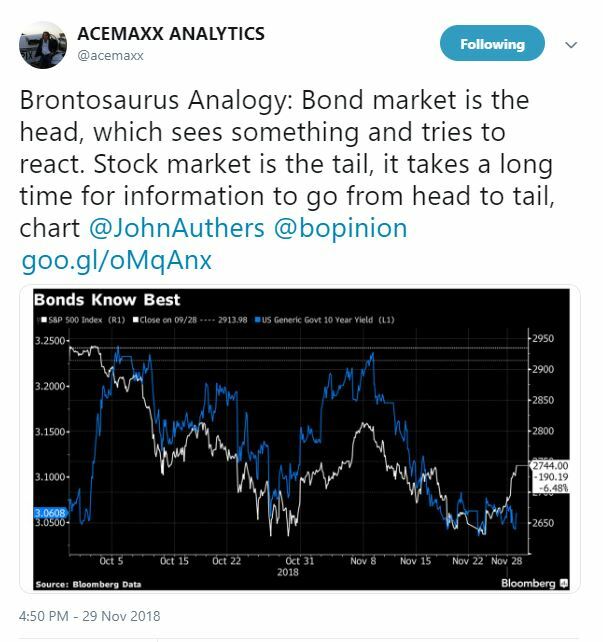 I think this brontosauros analogy is spot on. I’ll write more about bonds, stocks, and forex in my outlook fortehyear ahead next month. US data: Keep your eye on this, especially in a data dependant Fed world (noting the market will front run any expected changes). The number is ridiculously low given the size of the US economy but there has been a noticeable lift in initial jobless claims in the past couple of months. Also out last night was data showing presonal spending in October was up 0.6% mom, personal income up 0.5%, but core PCE prices (Fed like’s this measure) dipped from 1.9% to 1.8%. Headline PCE was 2%. Brexit: Still burning in the background. Worth noting we had confirmation Thursday that – as we discussed last week – all teh procedural votes and alternatives to Brexit will go to the Commons before Theresa May’s deal. So still a couple of week’s away. Elsewhere Scotish parties remain united against the deal and the EU is saying this is the deal, take it or leave it. On balance markets are a little worried. GBP is underperforming the Euro and Yen at the moment in this USD weakness. Europe: German inflation continues to give the ECB the backstop for the withdrawal stimulus. While the 0.1% print for November CPI was a smidge lower than expected the 2.3% yoy rate for headline and 2.2% HICP rate is still above target. Italy is still negotitating its budget in public. Interestingly Salvin and Di Maio seem slighthly at odds in their pronouncements, Salvini says only a small cut to the deficit for 2019 is planned while Di Maio says there will be a budget compromise. Either way, that a fight is being averted has helped Italian bonds rally outright and as a spread to German bonds.That, and German inflation, is helping the Euro over and above the USD’s own dip. One thing you have to note about China’s president Xi is that he is actively and assiduosly continuing his reorms of the economy to rety to work out excesses. Bloomberg reports that P2P lending is the next cab ofthe rank for regulatory scrutiny. “Alarmed by a surge in defaults, fraud and investor anger, Chinese authorities are planning to wind down small- and medium-sized P2P lending platforms nationwide, people with knowledge of the matter said. “. And here’s a question for you, just something to pnder as we head to the G20. Who isright, the big rally this week in the US or the big capitulation and reversal we saw in CHinese stocks yesterday. The correlation is low certainly, but that’s a curious move. Let’s see how things go today. The USD fought back from it’s lows overnight. But on balance it remains under pressure as markets bet that the fed has turned a little dovish, as the price stalled below the recent high – most important point – and as traders and investors prep for the G20 meeting and hopes of TradeWar glasnost. It remains my contention that the USD losses ground if there is a break thrugh in trade. That is because such a cooling in tensions would be seen as a boost for the global economy, for China, for growth, and as such it would also be seen as teh US lifting its foot of the throat of a number of countries and their currencies. Likely it would be very good for the Aussie, for the Yuan, EM, and also for the Majors against the USD – but probably to a lesser extent. For the moment support held and must hold in DXY terms if the USD is going to recover. But you can see in the candles and the MACD that momentum is waning. So the USD needs a kick start of other currencies need a catalyst to weaken. It could be trade this weekend but likely as we head into December it will be the data flow which is the big driver. Interestingly we have already seen strength filter into EM currencies with theUSD again down against the ZAR, TRY and the INR by decent percentages in the past couple of days. That fits withthethesis that markets are expecting a positive resolution to the trade war at this weeeknds’s G20. We are also seeing that in the price action of the USDSGD which is down near the bottom of its mild upchannel. This is one I watch closely as the developed market EM currency. I know that’s messy and I know the MAS is a formidable opponent when it comes to the SGD. But I like it as a proxy for what investors are thinking. So maybe forex traders are already baking positivity into the cake. Not baked in is a positive Brexit. But GBPUSD like so many other pairs is still trading a range. The question is whether the weekend confab will be the evnt to shake up the USD and with it the recent ranges, or will it be a range reinforcer. Can I suggest you have a look at this CNBC story where Morgan Stanley’s Hans Redeker maps out his case for a weaker USD in time. Even if you don’t agree it’s worth reading opposing views. I’ll gothrough the individual set ups in the video. OIL – Another big night and a rollercaoster ride for oil traders. Having broken recent lows as Europe entered the fray prices fell completely out of bed – again – befor buyers reentered on news that Russia may, afterall, be willing to play ball withthe Saudis to cut prices. So not yet, but in principle. 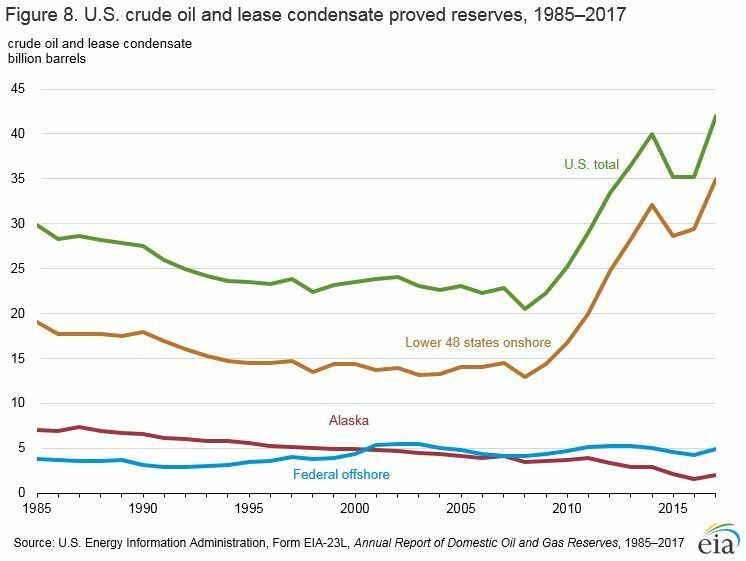 Will that be enough for the Saudis and OPEC? Will it be enough to stop the rot in prices? Given the recent price declines my sense isthe answer to both questions is yet. But the level of supply cuts will be an issue. The Saudis will likely want more than the Russians. While we did see a break of the recent lows for both Brent and WTI they have recovered strongly and on a close basis are up 2% and 1% respectively. If oil can hold around and form a base then a rally can ensue. Thursday’s move is the first time for a while the break of an important low hasn’t seen utter capitulation. Sure the Reuters story changed the narrative, but from a price action point of view in a few days traders are just going to look at the chart, the candle, thebar, the moving averages, they won’t be asking why. So while oil is still vulnerable for a move to the next support in WTI terms is $45.45 and in Brent it’s $54.34. Last night may be a sign of seller exhaution. Yesterday I lead off with “not quite there, yet”. Today it’s not quite able to hold. Certainly the Aussie has done well and is at 0.7318 after dipping a little under 73 cents not long after the Fed minutes were released but its run to a high around 0.7344 ran into sellers. 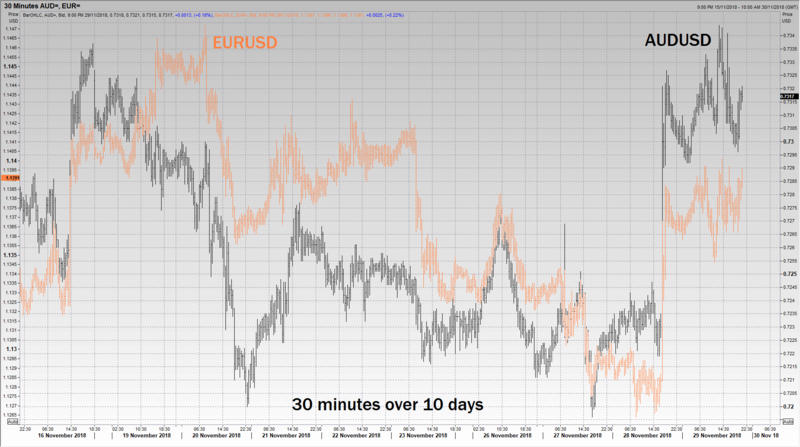 But as you can see in this 30 minute chart over the past 10 days the Aussie is mostly trading with Euro and ran into selling around the same time as the Euro. Thus, AUDUSD is being driven by the other side of the cross and is simply trading as a derivate of the USD moves at the moment. That’s important because if a trade deal can be reached over the weekend then the Aussie will get a doble whammy of positivity toward risk assets and a weaker USD. So watch this space. For the moment though we’ve seen a little false break of the range from two weeks back. Just, but still below the 0.7335/40 region it needs to crack to run to 0.7440. It may yet. But respecting this 0.7160/0.7340 range unless or until it breaks. Rallies and collapses end when buyers and sellers get fatigued. Is that what we saw yesterday as the ASX was unable to make the break and run to the next level of resistance around 5.800. It could be, at least in teh short term. That level remains resistance in the SPI and I’ve added a two-touch trendline this morning which coincides with it as well. SO we’ll see. OIl up, copper down, US stocks a little red, a big G20 meeting – you’d be forgiven that after the opening shenanigans traers decided to take a little of the profit they may have made from the recent bounce off the table. Realistically though the outlook will become clearer – hopefully – after the G20 when we’ll know where the trade war is going. And with that the likely impact on CHinese and global growth. Like the S&P it looks like we might have a big old range. Support today, 5,713.